As I bite into this brownie I escape into sweet chocolate bliss. 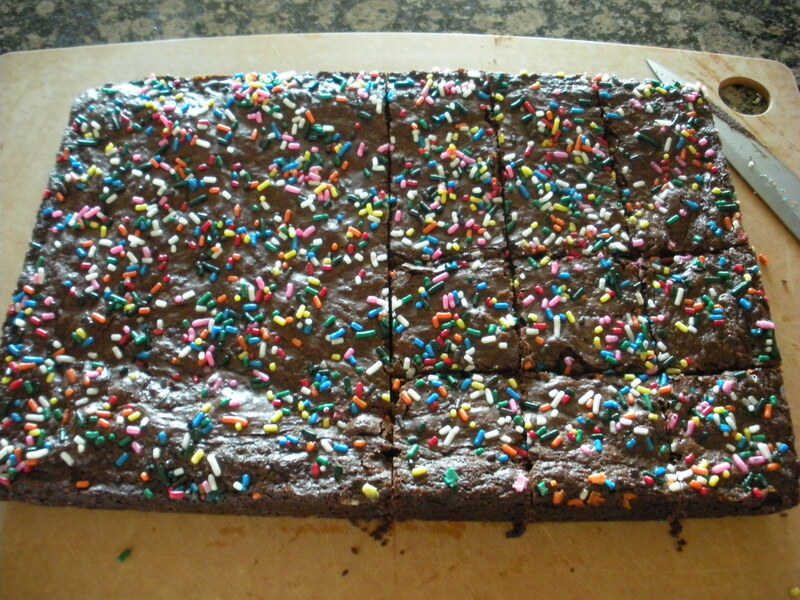 The texture is fudgy yet delicate and the flavor decadent yet not overbearing. I taste each ingredient from the subtle brown sugar to the obvious fleck of kosher salt down to the creaminess of the butter. If only you could smell my kitchen right now; the scent coming from the oven is like a warm hug on a cold day. I love a good brownie because it satisfies my wicked sweet tooth and has a texture that is a cross between a cookie and a cupcake. I have tried many recipes but most end up slapping me in the face with dense chocolate punch that sticks to the roof of my mouth and I quickly retreat from finishing the square. This has been my go-to dessert lately and every time I serve a plate of them people go crazy. They are relatively easy to make, freeze well and along with being sturdy enough to transport they make for an all around great dessert. I also appreciate the large 9×13 inch batch size because the typical 8×8 inch batch is never enough. I found this recipe on David Lebovitz’s website and have only modified it slightly by adding ½ tsp. instant espresso powder and omitting the Altoids. The espresso does not impart coffee flavor but rather adds depth to the chocolate flavors. Finish them by adding sprinkles or a classic dusting of powdered sugar. Enjoy! Preheat the oven to 350F. Line the inside of a 9 by 13-inch pan with foil. Lightly coat the foil with butter. In a large bowl set over a pan of simmering water, melt the chocolate and butter. Once the chocolate is melted and smooth, whisk in both sugars. Remove from heat and whisk in three of the eggs completely, then whisk in the other two along with the vanilla extract. Sprinkle the flour mixture top and using a spatula, gently fold in the dry ingredients until just combined. Do not over mix. Can I use Bakers baking chocolate or should I stick to Trader Joes brand? Where do I find instant espresso? Hope they are as good as when you make them! I can taste them now! Gretchen – DO NOT use the Baker’s Unsweetened chocolate. You’ll need dark/semi-sweet chocolate. As for brand, you get out these what you put in them. I recommended the TJ’s brand b/c it is good flavor for the price and easy to weigh if you don’t have a scale, simply leave out 10 squares. Avoid using semi-sweet chocolate chips as they contain an emulsifier that helps maintain the shape which might have an effect on texture in the brownie. One more thing…cocoa powder is not hot chocolate. I was referring to unsweetened baking cocoa. I hope this helps, let me know how they turn out! I love your new site, the recipes sound fabulous, can’t wait to try them. You are wonderful, who else could describe the scent of your kitchen to a warm hug on a cold day. You really should be a writer you know. Thanks Mrs. B! You are too generous with the compliments. You always inspire me to cook and not a day goes by that I don’t hear my mom say “Mrs. Byrnes gave me this recipe”.